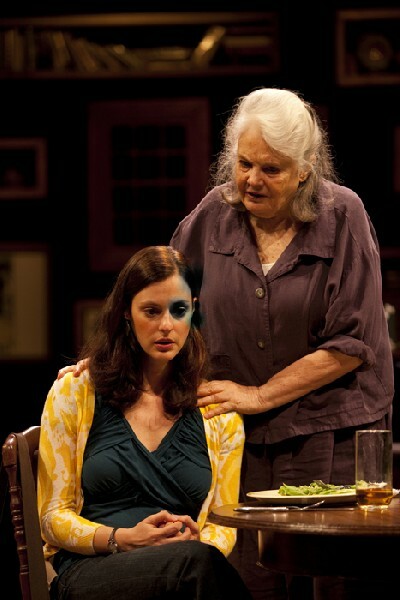 Emma (Katharine Powell) and her grandmother Vera (Lois Smith). Photos T. Charles Erickson. Morty (David Margulies) toasts Emma announcing his intention to will his fortune to her foundation. The sisters Jess (Meredith Holzman) and Emma discuss the revelation about their grandfather. 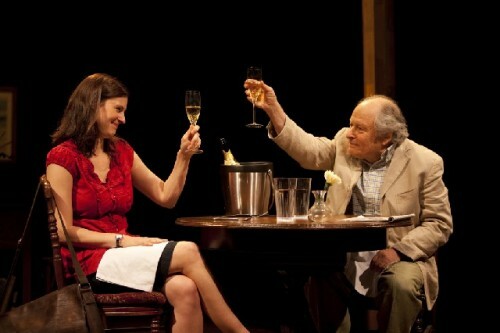 Emma’s parents Mel (Mare Winningham) and Ben (Peter Friedman) deal with the issues. Scenic Design, Clint Ramos; Costume Design, Kaye Voyce; Lighting Design, Ben Stanton; Original Music and Sound, Fitz Patton; Production Stage Manager, Hannah Cohen; Production Manager, Joel M. Krause; Casting, Melcap Casting. After the Revolution by Amy Herzog, which is having its world premiere on the Nikos Stage of the Williamstown Theatre Festival, is a powerful, intelligent and poignant play. Two summers ago, the first under artistic director, Nicholas Martin, three new Nikos plays went on to Off Broadway. Last season was widely reviewed as a disappointing wash. In Martin’s final season as artistic director, he will return next season to direct one production, we have a singular work of art that is a tribute to his taste and vision. After the Revolution was entirely nurtured through WTF as its Fellowship Play. It was developed in rehearsal last season and given a staged reading. It made such a powerful impression that Martin scheduled the current production which is sharply directed by Carolyn Cantor with a superb cast. The play resonates with members of the audience who identify ourselves as liberals. Although not as radical as I would like to be, my social and political views were formed as an undergraduate at Brandeis University. It catapulted to the top tier of American universities as a haven for many brilliant, black listed professors. It was a curious benefit of the shameful, post war era of McCarthyism. During my undergraduate years the campus hosted many of the leading American Marxists. The primary mantra was dissent and to question authority. This play about three generations of a family embedded in radical leftist ideology kept me on the edge of my seat. This could have been the family drama of so many of my friends and classmates. But not mine. My parents were more centrist and conservative. Although my Uncle Freddy was a member of the Party and read the Daily Worker. He always preached to me the struggles of unions and civil rights. The play begins with the banter of the brothers Ben (Peter Friedman) and Leo (Mark Blum). One is a professor and the other is a public school teacher who lightly converse about efforts to expose apathetic students to leftist philosophies. Their students include inner city blacks from the Roxbury district of Boston. In this family setting, we meet Vera (Lois Smith) whose husband, vilified during the HUAC Congressional hearings led by Senator Joseph McCarthy, passed away just a few years previously. Her granddaughter Emma (Katherine Powell) has created a foundation in his name. The purpose is to continue the fight for the radical left. Its primary current focus is the death row defense of a Black Panther, Mumia Abu-Jamal, who has been convicted of murdering the Philadelphia police officer, Daniel Faulkner. It is 1999 and the brothers have just learned devastating news. A book by John Earl Haynes and Harvey Klehr “Venona: Decoding Soviet Espionage in America” is about to be published. Their father is discussed in two pages of the 500 page book. Like 349 others he has been named as having been a Soviet agent during World War II. At the time he held a minor position in the OSS assigned to investigate Japan and international trade. He repeatedly denied being a spy when not taking the Fifth during the HUAC investigations. His life was devastated by the Black List including divorce of the mother of his sons and an inability to find real work. But he escaped trial for espionage. In 1953, Julius and Ethel Rosenberg were convicted and executed for allegedly passing nuclear secrets to the Soviet Union. A generation before them, in 1927, Ferdinando Nicola Sacco and Bartolomeo Vanzetti, Italian born anarchists, were executed for an alleged murder during a holdup in Fall River, Massachusetts. The Alien and Sedition Acts were four bills passed in 1798 by the Federalists in the 5th United States Congress during an undeclared naval war with France. They were invoked during World War One by President Woodrow Wilson to incarcerate and crush the International Workers of the World (Wobblies). It was the party of John Reed, a journalist in Russia during the October Revolution, who wrote “Ten Days That Shook the World.” The Communist Party of America (CPA) emerged during the depression years from the dismantled IWW. The book is not a revelation to the brothers who knew for some time that their father had spied for Stalin. They accept that in the context of the period. Before America became involved in the war the Soviets suffered millions of casualties fighting Nazi Germany. American communists believed in and were committed to a global revolution. That’s the background of history and politics. But Herzog’s play is not a dusty academic discourse or hectoring example of refried agit prop. What makes this compelling theatre is the effective manner in which she frames this within the context of a family. Her primary focus is on Emma. When her father informs her of this development, which he and her uncle do not deny, she feels betrayed and outraged. For her there is a sharp line between being victimized by McCarthyism and betraying America as a spy for Stalin. It was precisely the issue of Stalinism that so divided the American left during the 1950s. I know and have argued with hard line Stalinists. But for Emma, it is black and white. She is devastated and severs all ties to her father. Not only did he fail to inform her, he was the first trustee when she formed an activist organization in her grandfather’s name. As a consequence of this revelation everything that she stands for is in question. How can she continue to run an organization named for a traitor who spied for Stalin? Just after learning this news she has a meeting with Morty (David Margulies) a comrade of her grandfather and primary donor to her organization. While never a member of the CPA, about which he has regrets, Morty “ran with” the Marxists but lacked their courage. He was never called before House Un- American Activities Committee (HUAC) but states to Emma that he probably would have named names. Like Elia Kazan and others. How well I recall watching the hearings on TV and the mantra of McCarthy "Are you now or have you ever been a card carrying member of the Communist Party?" Over a toast of champagne Morty informs Emma that he intends to leave his entire fortune to her foundation. For reasons she does not immediately disclose, she declines the offer. We follow Emma as she absorbs the shock of this news. It has an immediate impact on her relationship with her lover and partner in the foundation, Miguel (Elliot Villar). He is a just graduated attorney accepting a minimal salary to devote himself to social justice. Initially, she expects his support which wavers when she implies that she is abandoning her commitment to the foundation. She is not even interested in reading the brief he has prepared in defense of Abu-Jamal. Emma speculates that they may be trying to put a murderer back on the street. In this reversal she expects Miguel to understand and back her. When he questions her decisions she turns on him. More and more we see Emma closing in on herself; shrouded by petulant, self righteous indignation. She refuses to answer the phone including calls from her anguished father. In a plot twist which is not entirely convincing Emma visits her troubled sister Jess (Meredith Holzman). It seems that Jess bounces in and out of rehab. Emma wants to inform her about their grandfather. But it seems that Jess already knew. During a trip to England with their father a few years prior he told her. Compared to her other issues Jess is not that concerned. But it registers as a deeper betrayal to Emma. As Emma’s world implodes fueled by outrage, betrayal and a perception of the moral high ground Herzog brilliantly weaves seeds of doubt. From the hindsight of 1999 passing secrets to the Soviet Union seems so black and white. Arguably it was more gray. In 1953 I read with great interest Herbert Arthur Philbrick’s “I Led Three Lives: Citizen, 'Communist', Counterspy.” I bought an autographed copy in Brown’s Department Store in Gloucester which I gave to my father as a birthday present. I’m not sure that he read it. The book became a long running TV series starring Richard Carlson. I vowed to dedicate my life to fighting Communism. During civics classes in school we were shown movies depicting the spread of communism. By October, 1957 the USSR won the space race by launching Sputnik. This was the political mood that prevailed in America until Vietnam, the Civil Rights Movement, Feminism and Gay Liberation during the 1960s. During a second lunch meeting with Morty, Emma declined his gift. He berates her for abandoning the good work and all those whom Emma pledged to support. No, he is not that surprised that her grandfather had been a spy. Big deal. It doesn’t alter his view of him and a lifetime of good work for the cause. “In those days if you threw a rock in the Village you hit a spy.” Everyone was passing off information. So what. He brings her up to speed with the mood of the zeitgeist. The realities of the Great Depression. Today we take for granted all of the social entitlement benefits fought for through the American left. Prior to the New Deal there was no safety net for the working class. Herzog's play is particularly relevant as Americans again endure an era of hard times. It is remarkable that Herzog, a young playwright, has created such a complex and richly nuanced narrative. This is an absorbing and compelling drama. It conveys a broad sweep of liberalism in America. Her play allows us to find our own position in the arc of her trajectory. It is a drama with distinctly different messages targeted to the age of those in the audience. Most importantly it informs a new generation with little direct knowledge of the struggles of liberalism in America. Today we live under the chilling shadow of Fox News, the gonzo Tea Party, the charismatic misinformation spewing from Sarah Palin and Anne Coulter among others. In this screed of rhetoric Liberal is synonymous with Anti American. Ok, this play made me feel good about myself. But I hope it doesn’t just preach to the choir. This is a stunning work of art which deserves to have the widest possible audience. Surely it is the best new play of a rich and diverse Berkshire season. We will be hearing more from Amy Herzog for years to come. Bravo.